FutureYou switch on any business news channel on television and some of the most spoken topics include Sensex and Nifty. You can refer our article on the Sensex, this article refers to the Nifty. Nifty Definition or What is NIFTY? The NIFTY 50 or simply NIFTY as it is popularly known is India’s most tracked Index from the house of India’s leading stock exchange the NSE – National Stock Exchange. The value of the NIFTY is a single numerical representation for 50 of its Index constituents. The NIFTY 50 index number is India’s benchmark index and is reference of the current state of the markets. It measures and tracks the stock movement of 50 index constituents known as the Nifty Index stocks. These NIFTY 50 are highly liquid and come from different sectors of the Indian economy and collectively form the NIFTY. Simply said, the NIFTY 50 is the synonymous with the NSE itself. 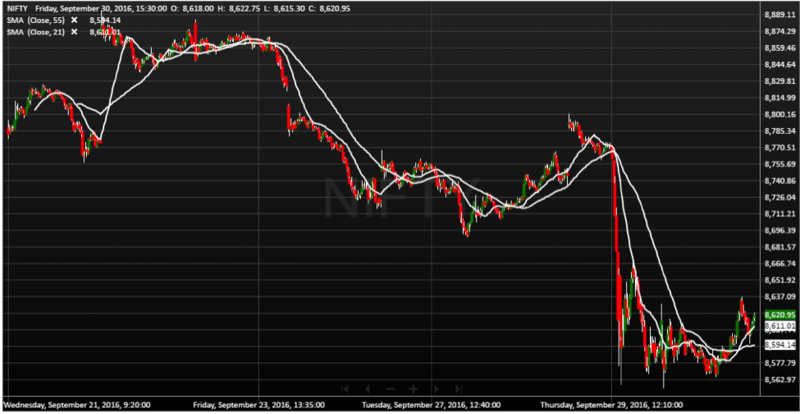 How can one track the NIFTY live or figure the real time value of the NSE NIFTY today? Investors/Traders can track the Nifty live on their SAMCO Online trading platforms. To track the NSE NIFTY Live on the SAMCO Trading platforms, check out this article which explains how to add the Sensex and NIFTY indices in the SAMCO NEST Trader. You can get real time quotes of the NIFTY on your trading terminals. Traders and Investors can also check the value of the NIFTY live on the NSE India website however, there may be a short delay in the prices since they are not streamed live. A Rs. 1000 investment in the NIFTY Index in 1995 would have been worth Rs. 9000 in September 2016, a Compounded Annual Growth Rate – CAGR return of 12% excluding dividends. The average dividend yield for the NIFTY has been approximately 2% and the blended average for NIFTY Returns has been approximately 14% i.e. 12% + 2%. The NIFTY historical data can be found from the NSE website and the daily bhavcopy can also be downloaded from the SAMCO website. How does the NIFTY live calculation work? How is the NIFTY quote updated each second? The NIFTY 50 comprises of 50 companies across various sectors and their weights and ranks are based on the Free float market cap method. Each and every company in the NSE NIFTY has a weight assigned to it based on the Floating Market Capitalisation method (and not the Total market capitalisation). The list of the 50 index constituents can be found here. Every move in the live price of the NIFTY is the sum of the weighted average movements of all the index constituents. What’s the view for the NIFTY this week? SAMCO publishes its outlook on the Indian Stock Markets on weekly basis on its Stock Market Updates page which include NIFTY news. You can get the latest NIFTY updates, news and NIFTY view for the week ahead with the SAMCO Weekly Market Update. Nifty being the composite of 50 large cap stocks offers the most sophisticated instrument for profitable trading. Because no individual stock has substantial influence on the price moment, trading Nifty purely on technical analysis offers huge possibilities to profit using appropriate tools for analysis. Strategies that have stood the test of time for intraday trading is the moving average cross over system. No other indicator is required if the cross over system is followed with rigorous discipline. On a 5 Mins chart using 55 and 21 bars simple moving average cross over system is a very profitable nifty trading system for intraday trading. Huge profits can be made provided the trader has the discipline to take all trades which the system generates. How does a NIFTY Intraday Chart look like and how can I check intraday charts in SAMCO’s online trading platforms? 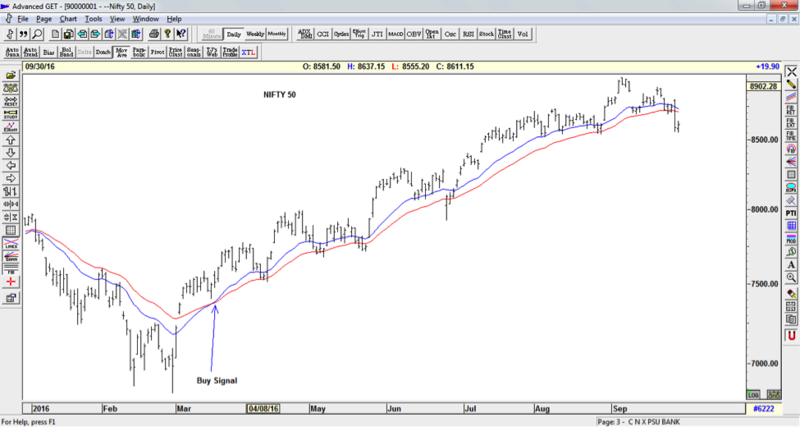 Below is an example of how the NIFTY Intraday chart looks like in the SAMCO NEST Trader. Check our article on how to check intraday charts in NEST trader for information on the same. Nifty being the composite of 50 large cap stocks offers the most sophisticated instrument for profitable trading. This is the only instrument which has minimal overnight risks compared to other individual stocks and hence can be traded on positional basis for better risk adjusted returns. For positional trading on daily basis, crossover of 21 Day and 34 Days EMA is very a profitable trading system in Nifty. Whenever the 21 Day EMA crosses the 34 Day EMA from below a buy signal is generated and vice versa for sell. Rigorously following this NIFTY Trading system generates huge profits on a sustained basis. How can a common investor mirror NIFTY Returns? According to the world’s most decorated investors Warren Buffett, one of the best ways for an average retail investor to consistently generate returns in the stock markets is buying the indices regularly and using the principle of rupee cost averaging while buying the same. This investment approach is also known as an passive investment approach. This approach over any other random or active investment approach can compound wealth for an average investor over long periods of time. But how can one buy the NIFTY to get close to the NIFTY returns? The easiest way is buying a NIFTY 50 ETF i.e. a NIFTY Exchange Traded Fund which are linked to the NIFTY. Alternatively you can also buy SENSEX ETF’s which are linked to the Sensex. We’ve tried to cover all NIFTY ETF’s in the list. However, this shall not be construed as a recommendation to buy the same and shall be used for education, information and reference purposes only. NIFTY Intraday trading strategies and Positional trading strategies discussed above are solely for educational and informational purposes. Reference to trading in the NIFTY is with respect to NIFTY Futures. This is not a solicitation to trade and also should not be construed as trading/investment advice. The trading strategies shared for Intraday nifty trading and positional trading are great. What stop loss must be kept in this kind of strategy? Thanks. Please make more such posts to help trade profitably. It is a stop and reverse strategy, whenever the cross over signal gives the opposite signal it is either an exit or stop loss. Very in-depth article with great analysis. Hats off.